CHARLENE (left) and Edmund Lim sharing a number to add merriment to the evening’s function. 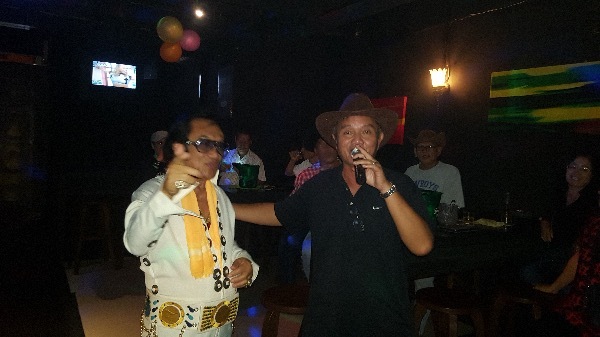 EPFCS president and Elvis of Kuching Elges Presley doing his favourite ‘G.I. Blues’. Elaz performing a top EP hit of the 60s. ELVIS Presley of Sarawak 1965 title holder Eskandar Eyaw still rocking and rolling at 73. JULIE (3rd left) poses for a photo with the five ETAs and a female guest prior to the start of the show last Thursday evening. THREE Js as Julau’s beauties Julie and Jacqueline unite for a photocall during the tribute show by five King’s men last Aug 16 at Eclipse. ELGES is trying to get Ed Lim (right) to join EPFCS and appear in an EP jumpsuit in next year’s 42nd anniversary homage. 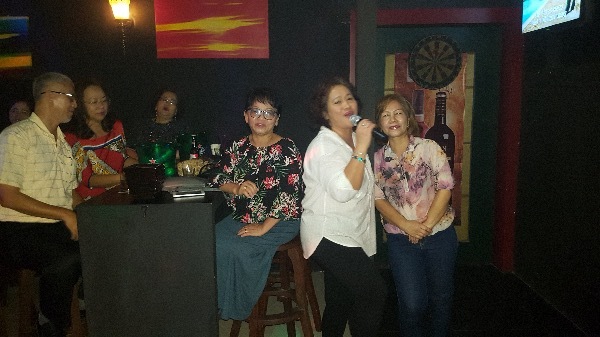 THE ladies are not to be left out as at least three of them also oblige with songs on karaoke for the evening. THE King’s men and their supporters last Thursday evening at Eclipse. 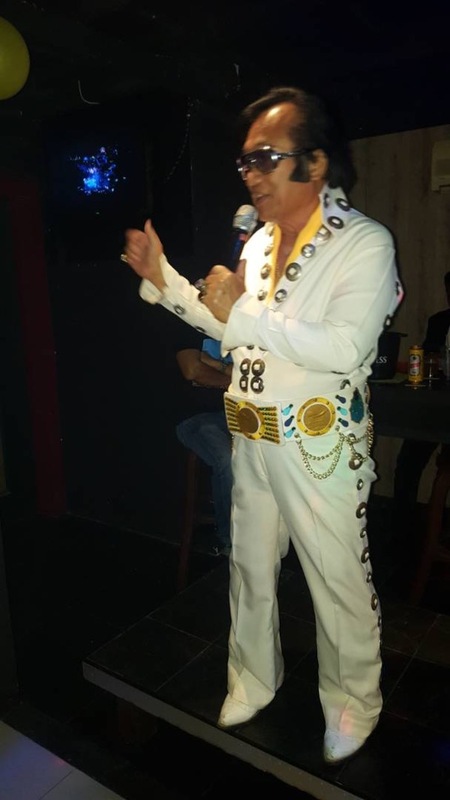 On August 16 last week loyal legion of Elvis Presley fans and impressionists paid tribute to their idol by having a gathering to mark 41st anniversary of The King’s untimely demise at the age of 42 in 1977. Celebrated the world over, and rightfully centred at Graceland in Memphis, Tennessee, USA, the final resting place of Rock and Roll King Elvis Aaron Presley, the 41st anniversary gathering in the Land of Hornbills’ capital city was held at new music joint Eclipse, at Jalan Song, co-owned by Julie and Charlene who are both local Dayak celebrities. 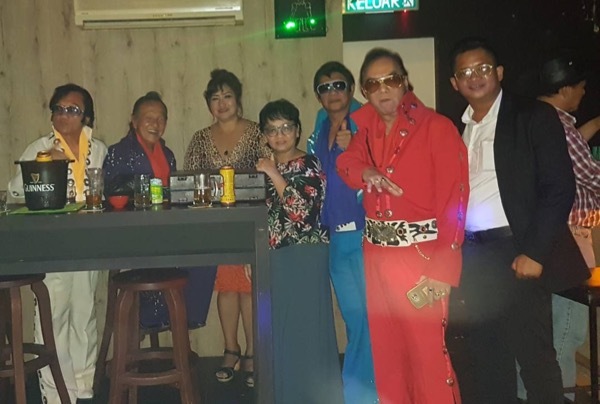 Inspired by Julie and Charlene, Elvis Presley Fan Club of Sarawak (EPFCS), led by its president Ges anak Barundang, popularly known as Elges Presley, gathered five of the state’s top EP impressionists to perform as tribute to the man referred to as ‘The King’ in life and death. 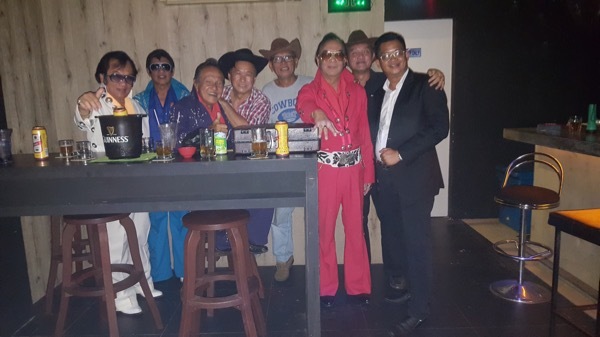 At 62, Elges, Elvis of Kuching title holder, who toured Graceland and stayed at its Heartbreak Hotel in 2004, is neither the youngest nor the eldest of the Elvis Tribute Artistes (ETAs) in performance last week. It was Elvis Presley of Sarawak 1965 title holder and also the most senior ETA in town Eskandar Eyaw, 73, who led the group in terms of age and experience. And last week at such an age he was still shaking and rolling like a 40-year-old. “Good to be still around and rocking at this age. 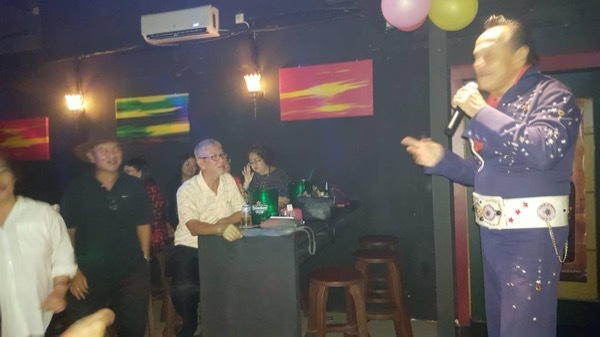 Tomorrow I’m off to Johor Bahru to join some of our EP counterparts in West Malaysia to perform at Marbella, a popular joint for the same tribute to our beloved idol, The King,” said Eskandar, whose stage name is Elkandar, of the start of his last Thursday’s performance, donning his dark blue EP jumpsuit. Crooning favourite EP top hits of the 60s such as ‘Angel’, ‘Doing the Best I can’, ‘No More’, ‘Good Luck Charm’, Elkandar still has got what it takes to be Elvis. His soothing voice is perhaps among the closest to the real thing. The youngest of these Hall of Famers wannabes Adrian David Junior, 30, started the ball rolling for the evening with a medley of ‘Heartbreak Hotel’ and ‘Hound Dog’, followed by ‘Cheating Heart’, ‘American Trilogy’ and two other songs that kept the crowds on their feet rocking and rolling to the rock and roll tunes. He joked that his Aloha EP suit was left in Graceland though in actual fact his three or four EP suits could not fit anymore, ‘thanks to the last four months of good food’. “So, here I am in this early Elvis era outfit,” said the young King’s man from Bau. Twenty minutes or so earlier experienced DJ Daniel James, who trained hard for 18 years in Kuala Lumpur, played Elvis intro music ‘Sprach Zarathustra’ that gave a thrilling inspiration for the five EP impressionists to start their acts with the pioneering tune of rock and roll ‘That’s Alright Mama’ in a shared performance. Elval, that’s me, played EP act number three. After over a decade of use, unlike Adrian’s, my red concho is still fitting well. It was certainly apt attire for ‘Such a Night’, a song that I rarely performed but did so to give a sense of ripeness to the figure 41. Also included in my repertoire for the evening were ‘Shake Rattle N Roll’, ‘King of Whole Wide World’, ‘Baby I Don’t Care’, ‘Jailhouse Rock’ and a few more. Sarawak silat maestro Azmi Jahidin @ Elaz took to the stage after yours truly, rendering his own EP favourites such as ‘Make The World Go Away’, ‘Let’s Pretend’, ‘Follow That Dream’ and many more top hits of the King. Dressed in a light blue EP jumpsuit, Elaz also said he was to be Johor Bahru bound the next day with Eskandar to join the JB’s Marbella show together with our friends and EP acts from West Malaysia. Our EPFCS president was the last to take to the stage. Attired in a white concho, Elges started with ‘G.I. Blues’, reminiscing Elvis’ stint in Germany (1958-59). Then came other favourites such as ‘Love Machine’, ‘Little Less Conversation’, ‘If You Love Me Let Me Know’, ‘Runaway’ and a few more to the delights of the very responding patrons. 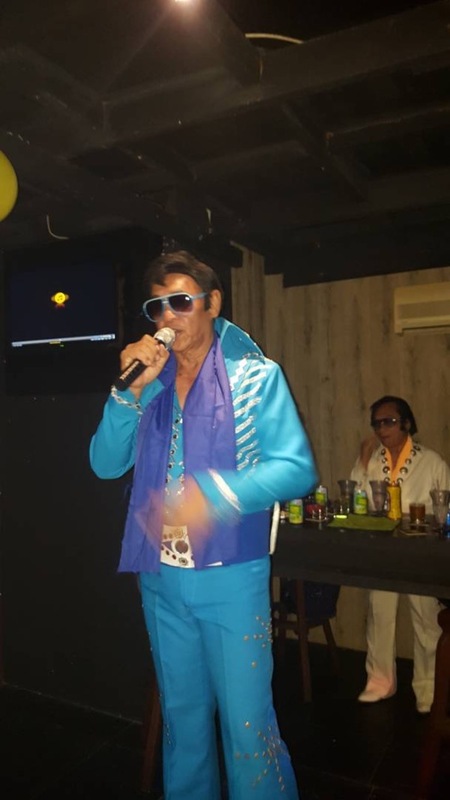 “When I performed in Graceland, the locals there said they were surprised that an Asian could produce a truly Elvis sound, so I told them, if you go to Kuching in Sarawak, Malaysia you’d be more surprised to see a few EP acts there with an uncanny resemblance to the King and a voice to match their looks,” Elges told the big crowds at Eclipse about his tour of Graceland 14 years ago. During the interval of around 30 minutes, the mike was shared by the patrons that centred on table number six with an ardent EP fan Edmund Lim in attendance. Ed Lim, as he prefers to be called, has been following our shows for over a decade. Now retired, he hinted that he might appear with us in EP suit ‘quite soon’. 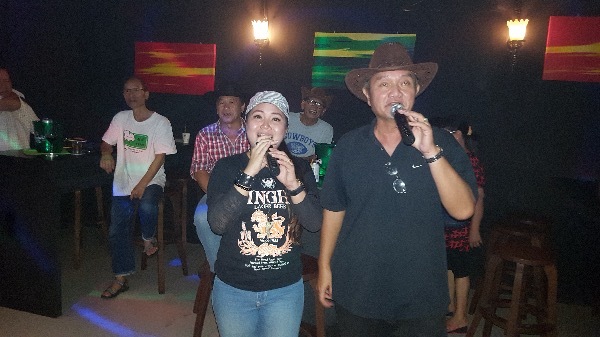 Last Thursday evening, Ed crooned at least seven or eight EP songs on karaoke. These songs included ‘Moody Blue’, ‘Sentimental Me’, ‘Wonder of You’, ‘Burning Love’, ‘Blue Suede Shoes’ and a few more. Other than Ed, there were a few songs from the ladies, including Julie and Charlene. 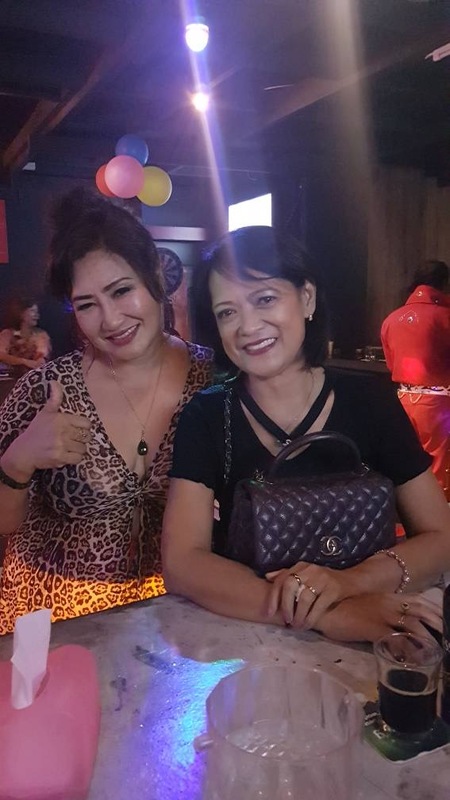 It was certainly an awesome evening for all especially when the five EP acts came back on stage to perform more popular hits for their second slots. Even at 2am, there were new arrivals for patrons. For them night life had just begun. EPFCS is e-ROS registered and has an online membership of over 3,000 statewide. Its aim is to reachout to people anywhere to share the music and songs of Elvis Presley. It is a non-profit organisation surviving on public donation. Our Advisor is Tan Sri William Mawan Ikom who is also Pakan Assemblyman and Sarawak Scouts Council President. Mawan was not able to come last Thursday due to a commitment outside the state. Our show last week was just a small part of the universal tribute to the King’s untimely demise 41 years ago. In Graceland, thousands paid tribute to The King on his death anniversary. They started to gather there starting Aug 15, according to WMC Action News 5, Memphis TN. The Gates of Graceland opened Wednesday at 8:30 p.m. for fans to walk up the driveway to Elvis’ gravesite. It was noted that Presley died from a heart attack on Aug. 16, 1977 when he was 42 years old. Every year, thousands of fans carry a candle in remembrance of The King. The gates remain open until all who wish to participate have done so, something that typically takes until the early morning hours. It was no difference this time around. In fact all over the world on last Aug 16, all the King’smen and fans came alive to pay homage to their idol The King. His music and songs are universal and have withstood the tests and taste of time. He lives on through his music and songs. Long Live The King!!! Tribute to Elvis on 41st death anniversary 0 out of 5 based on 0 ratings. 0 user reviews.